Looking around André Rieu enjoys his office, a castle in Maastricht. This was the way he wanted it and now is the way it is. 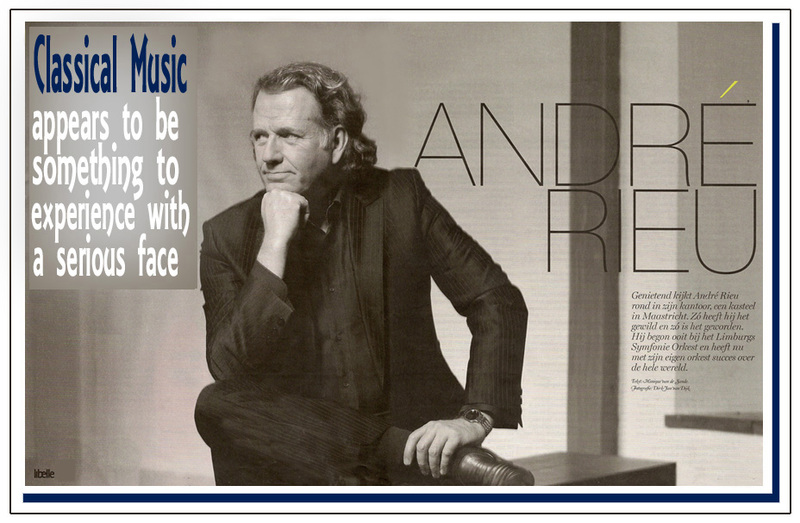 He started his career with the Limburg Symphonic Orchestra and now has success around the world with his own Orchestra. ►Last October you turned 60, but nothing indicates that you are working less. Your agenda for this year is completely full. Is travelling your life? "For the main part, yes. But I am not the victim of a manager who squeezes me out one year and throws me away the next, which happens often to artists. I wished to do this myself and I built it up together with my wife Marjorie. Of course we hate to be separated so often, you never get used to that. In the past, I remember lying in the garden and watching a plane fly over. I thought: "Maybe it is going to America". In my imagination I was on board already!". ►Isn't that hunger satisfied after so many years? "Oh no, I still love to see and get to know all those countries. In my case that of course includes the concerts. That drive never changes, I love to perform on stage. Addicted? No, for then you cannot do without it. I think I can do without it, well ... I am not totally sure … I have heard of runners who make in their body something called endorphin, which gives you a feeling of happiness. Maybe the same thing happens when you successfully perform on stage. I only know for sure that I gain a lot of energy from it. It is great to do what you like and what you are good at." ►In July you are giving concerts in the Netherlands again. Do you experience the concerts in your own country as different? "It is always nice to perform in my own country and I don't have to travel far. The Maastricht concerts are very special to us ... they are a home performance and I will enjoy that eight times this year." ►How are the Dutch concert attendees compared to the audiences abroad? "All the audiences are pretty much the same wherever we go. Music has no borders, that is the beautiful thing about music. What I like most about the Dutch fans, is that they also follow our road soaps. They really know everything about us, also behind the scenes." ►You have a career of 30 years in music and you are married to your wife Marjorie even one year longer. What exactly is her role in your musical career? "A major part, for sure. After the music academy, I was to become the eternal student. Then Marjorie said, "What do you think about the idea of finding a job and earning money?" Very wise, ha, ha. I started with the Limburg Symphonic Orchestra. I was not happy there and she knew that. I continued on there for 10 years ... you know how it goes ... We purchased a house, two children came. When I was ready to go out on my own, Marjorie backed me. In the beginning we lived on her income as a teacher. My orchestra (Maastricht Salon Orchestra) did not make much, but she thought it was more important that I could follow my heart." ►In the meantime your situation has changed radically. "In a lot of aspects, yes. But Marjorie still works very hard. Often I start the new tour in Germany and then she joins us to check the show with a notebook in her lap. At the end of the concert she tells me what can be improved. I am a terrible perfectionist myself, but Marjorie always knows how to make it even better. She also writes my texts for every new program. That works, because she knows me thoroughly. But above all she is my sounding board. Even if we walk the dogs together, we talk about work." ►Being a musician, do you also feel like an entertainer? "As soon as you're on stage you ARE an entertainer. Even if classical music is your repertoire. You may not say that, but it is true. People purchase a ticket because they want to be entertained. I do that with words and music. I have always admired Toon Hermans (a Dutch one man show comedian, who has passed away a few years ago). And I still do right now. His timing was sublime and he never told jokes to the prejudice of others. I don't do that either, although it seems to be a trend … I prefer to play with the audience … wait a little ... and then they laugh. That is nice. It is a pity that it is not appreciated by professionals. I have another example, Godfried Bomans who was in the eyes of critics no real writer! Because he was funny and he also earned money with it! ►You've been followed by the same negative criticism for years. "Indeed. Classical music appears to be something to experience with a serious face, preferably in a small audience. If you can put an entire hall upside down, that is of no importance. I use to think, Are those ten thousand people maybe all idiots?" ►In the meantime nobody can ignore you. You even received two official decorations. "That is right. In 2002 I was decorated as a Knight in the order of the Dutch Lion, and since 2008 I also received a French decoration: Chevalier des Arts et des Lettres. Those recognitions mean something to me. I can tell a nice story about the last decoration. The year 2002 was on it. When I drew the French ambassador's attention to that, he said, "That is no mistake. It was in our drawer that long". 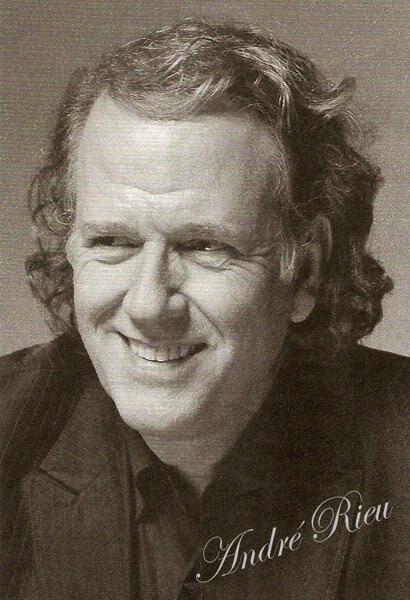 Apparently a former employee hesitated to give it to André Rieu. But in the meantime I have impressive company: Harry Mulish and Hella Haase (Dutch writers) also have the same decoration. And they are real celebrities!" ►Is there still something to conquer? "I have a lot more plans. I prefer to make classical music accessible to a big audience. That is what I am going to do! I just started with the second symphony of Brahms. An arranged version where I left out the difficult parts. Of course that is forbidden by the critics, but if I offer the complete symphony all at once, I lose my audience. So I'll do it slowly. And what is wrong with that? I intend to become 120, so I still have enough time." ►Did you ever have the feeling that you were not a good father? "You mean because of my career? The first years certainly not. I was still working with the Limburg Symphonic Orchestra and during the day I had more time than most other fathers. If at the elementary school something creative had to be done, then I was part of it. I was between all those mothers, on these little chairs, making St. Nicholas hats … I am very happy that I was able to do that and nobody can take that away from me. But even when I travelled more, I stayed a very involved father. I had the good fortune that my youngest son Pierre, went with me right away, to watch and help as much as possible. That evolved more and more and now he is the Vice President of my Company. That does mean that he travels with me less and it fits better into his life right now, as a father of two young daughters. Without Pierre things are less exciting of course. When he is with me, I can hold his hand before I go onto the stage and that is nice because I am always so nervous. I am not away from home for months at a time, I regularly split a long tour up. I am lucky that Pierre and his wife Eefje live right around the corner and you can be sure that I see those two little girls as often as possible." ►Your success is enormous. What does that do to you? "Nothing, except that it gives me lots of energy, but it does not change me. Fame is nothing. What difference does it make that I appear on TV more than somebody else? But okay, the outside world does react to that. You have to be realistic in that. I have permanent protection. I could think, Screw you, I just want to be able to walk the streets freely, but that would be just stupid. If Pim Fortuijn (Dutch radical politician) would have had protection, he would still be alive." ►Does your fame also have a positive side? "Absolutely. The affection that I experience is very nice. I also hope, with my fame, to mean something for the world. The idea that we won't experience heaven until after our passing, I have given up a long time ago. You have to create your own heaven on earth. I at least do my best on a small scale. With Marjorie I plant trees in Burkina Faso, for the past 20 years, where the Sahara is trying to take over. By now it has turned into quite a forest. It is called: the forest of friendship. There is an education center where people are taught it is better not to cut the trees. I am also planning to perform on the North Pole next year to draw attention to the melting Pole caps. We should not get stuck in negative thoughts, together we can achieve a lot. I am convinced of that." In the absence of John our Translator who is on vacation in Europe, we thank Ineke and Sonja for translating this. Thank you Ineke & Sonja for the translation and Sue for posting. Great picture of Andre too. Iris ~ It was left out, because the Rieu's publicly denied André ever said it. Always great for us Aussies to read about Andre and especially nice when Marjorie is mentioned so often, as in this interview - thanks Ineke & Sonja.